Contrary to commonly held belief, science and technology are not the neutral application and advancement of knowledge and technical capabilities. They are political, primarily designed and developed for the benefit of a society’s ruling class. Powerful military weaponry, advanced surveillance capabilities, job-eliminating automation, increased job precarity through Uber and the like—these are not natural and inevitable progressions of technology, but an intentional program set forth by the class that funds and directs it. 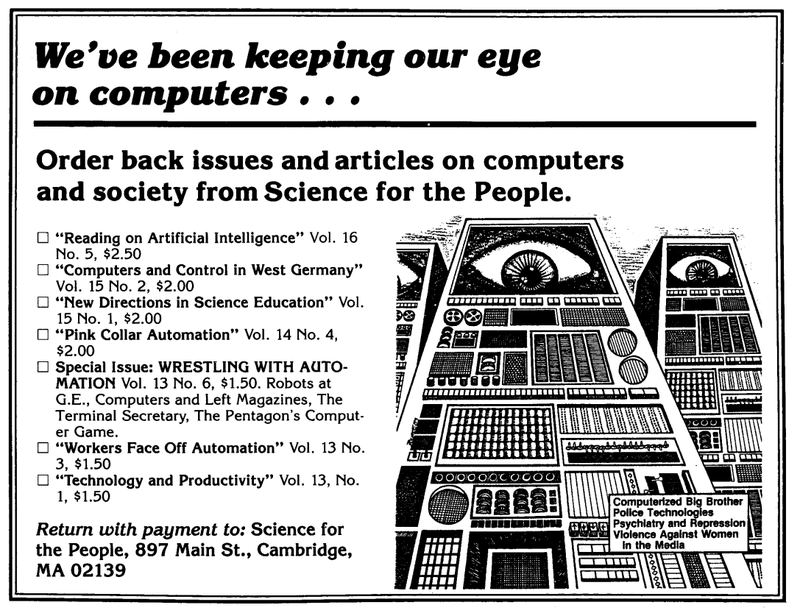 This political analysis of technology is one of the many significant contributions that Science for the People (SftP) made in its original publication run during the ‘70s and ‘80s. Of course, technology has advanced substantially since that time: the smartphones in our pockets today are many times more powerful than the room-sized supercomputers that existed then. But many of the political questions that we face today around technology are largely the same as they were then. Science for the People laid a strong ideological foundation providing structural critiques around the impacts of automation on workers’ struggles, the lack of diversity in STEM, the increased capacities of the state to conduct surveillance and repress dissidents, the development of AI and its relation to the military, and contributed many other political analyses that we can and should build off of in our struggles today. Below is a small selection and summary of these contributions from the latter half of SftP’s original iteration, paired with commentary about their connections to debates happening today, and followed by thoughts on where to take our movement going forward. Debates on the significance of increased factory productivity for manufacturing workers through new technology are not new. This piece analyzes the impact of numerical control technology on the metal machining industry and its workers, detailing the changes that were made to workplace configurations and the de-skilling of workers, with a focus on the ramifications for workplace struggles. Machines are designed and built with particular purposes in mind. 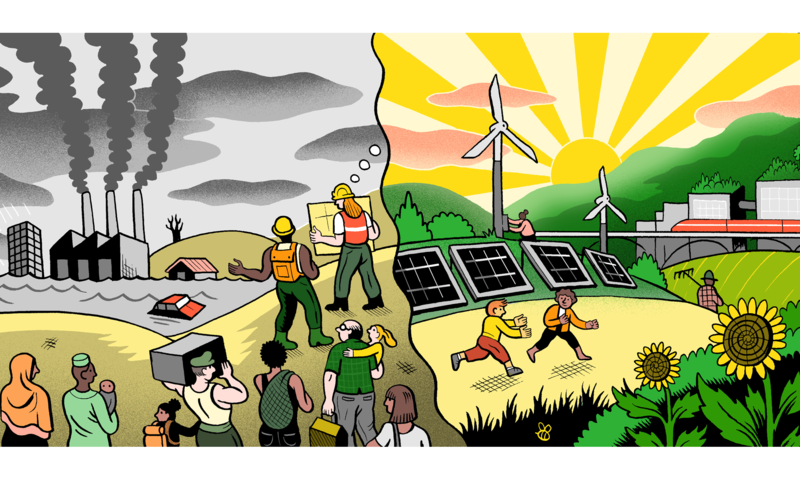 As long as the profit motive defines social benefit instead of equality and improved working conditions, science and technology will continue to benefit only the few economically advantaged instead of the mass of working people. We feel that the crucial issue of control of workplace computerization is vitally interrelated with all the rest of today’s major labor issues. This issue, which analyzed the numerous intersections of gender and science, contains an article describing how the introduction of new technologies frequently occurs simultaneously with both the degradation and the feminization of work. The introduction of the typewriter, for example, coincided with reduced prestige for clerical work and the work being shifted from men to women. The article further examines how technological advancement has led to an increased ability to supervise every detail of an employee’s work and mandate speed-ups. The piece ends on a positive note with something that is also increasingly true today—heightened efficiency means that each worker can actually have more leverage in the production process, and that a small but organized group of workers can seriously disrupt it. The author referenced a recent event in which 5,000 computer operators in Britain went on strike, paralyzing all financial transactions in the country, forcing Margaret Thatcher herself to settle with them. This is an important lesson to keep in mind today in not just technology work but logistics, distribution, and other fields as well. The lack of diversity in STEM continues to be a major issue today, and one that is gaining increasing attention. This article explores the challenges women face when pursuing studies in science and solutions implemented at Hampshire College that, if widely adopted, could make the learning environment far more supportive. The authors argue that it will take, among other things, a critical mass of women in teaching, a revised attitude toward what and how we teach, and a critical analysis of the greater structures that the field of science operates in. We still have a long way to go before we’ve made not just tech, but all of STEM, a diverse, inclusive, and egalitarian environment—and one that could benefit all, not just those directly involved in it. The extent of the mass surveillance apparatus that NSA whistleblower Edward Snowden revealed in 2013 shocked the world. But the rapid adoption by states of advanced computing technologies to monitor, analyze, and oppress their citizenry is far from new. This piece dives into the construction of the surveillance state in West Germany, ostensibly used to prevent terrorism (sound familiar?) but in fact used to suppress all dissent within society—and especially among the Left. Just as was reflected in Snowden’s revelations, private corporations were more than willing to assist. As with technological automation, some of the algorithms pioneered to analyze behavior could instead be used for good if they were responsive to the masses instead of the ruling class. Rather than looking at a person’s education level, income, and neighborhood to determine if they need to be surveilled and controlled due to their increased likelihood of committing crimes, we could use the results from these algorithms to help analyze and alleviate the root problems that actually cause crime to occur. Tesla co-founder Elon Musk calls artificial intelligence humanity’s greatest existential threat. In this article, the author reviews a handful of AI books, exploring questions such as what it means to have most AI research paid for by the military and the social implications as AI approaches the simulation of human intelligence. The article concludes that “The human use of increasingly human computers demands neither Luddism nor uncritical zeal, but rather detailed knowledge, a careful program, and a long struggle.” Elon Musk fears what it means for AI to take control of itself, while the rest of us fear something much more present—what it means for AI to be controlled by billionaires like him. Why does the ruling class always seem to be the primary beneficiary of technological progress? Many people, including tech workers themselves, believe that the perspective of those who guide technological development is in fact an objective perspective, and not one rooted in the ruling class’s desire for technology that extends or is otherwise compatible with their power. As the author states, “The viability of a design is not simply a technical or even an economic evaluation, but rather a political one.” New technology is typically designed to be authoritarian rather than democratic. And those who believe that the market will sort out these issues will be disappointed to learn that this Darwinian idea is yet another ideological camouflage for political power. We must understand this in order to organize for the power we need to place technological development into the hands of the people. The core arguments put forward by Science for the People are still applicable today, with any differences mainly being in degree rather than in kind. We must carry these arguments forward and build upon them for a new generation of scientists, tech workers, and activists. Of course, there are many new technological developments and debates that a revitalized Science for the People should engage in. We have seen massive growth in the technology industry’s role in society, with companies like Apple, Google, Facebook, and Amazon becoming the most powerful corporations in the world. Edward Snowden revealed how technology corporations and the US government have created a terrifyingly advanced and wide-reaching surveillance state. Big data and its algorithms have an increasingly unaccountable influence on society. Net neutrality, one of the very few meaningful checks on the power of internet service providers, is well on its way to being dismantled. Economic control is no longer the only way to wage “war by other means”, as we see the normalization of cyberwarfare between nations. Jobs are being lost, de-skilled, and made more precarious through automation and the “Uber-ification” of large segments of the workforce. At the same time, we are seeing growing radicalization and resistance in the technological sphere. Since Trump’s election many have woken up to what it means for a few technology companies to exert massive and totally unchecked control over our lives. There is a burgeoning demand for internet infrastructure to be municipally owned. Activists in New York City recently won a limited victory in making the algorithms used by municipal agencies more transparent and accountable. The billionaire founder and CEO of Uber was forced out due to public backlash over the company’s misogynistic workplace culture. And we are beginning to see rumblings of a movement to organize tech workers. Perceptions of and debates on technology are beginning to move again into the political terrain where they belong. The time is ripe for a new movement for a Technology for the People to contribute to this radicalization and the struggles that will continue to emerge.